Proudly promoting Ireland as a centre of excellence for all things Thoroughbred’. That’s the manifesto driving Irish Thoroughbred Marketing (ITM) forward as it promotes the nation as one of the leaders when it comes to all aspects of the racing industry involving Thoroughbreds. Established in 1991 as a subsidiary of Horse Racing Ireland (HRI), ITM is a ‘not for profit’ organisation that has become a vital cog in the machinery of the Irish racing industry. 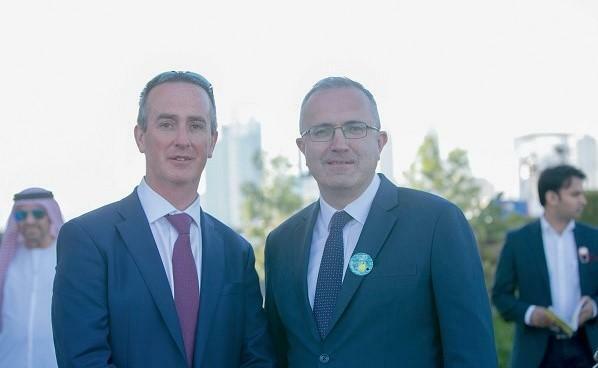 Al Adiyat spoke with ITM Chief Executive Officer Charles O’Neill at Jebel Ali Racecourse recently on a day his organisation sponsored a race. Excerpts... ITM have been coming to Dubai often and sponsorships like this are a good way to boost ties, aren’t they? It’s always good to be here in Jebel Ali and the thing that strikes you about this racecourse is the absolute friendship that you get. It’s one of my favourite racecourses and believe it when I say it, it’s one of my favourite racecourse anywhere in the world because it’s such a happy and friendly place and to be here and to sponsor a race is just brilliant. Dubai is a city that is constantly evolving, what do you think of its racing? I come to Dubai three times a year and I’ve been coming to the city for the fourth straight year. Every time I come here it’s a different city but whenever I’m here I always do visit Jebel Ali and Jebel Ali has always been the same. Its stands are always full and things are always happy here and the racing is always great. We had the ITM sponsored race there a few weeks back and the race was won by a Rashed Bouresly horse bought in Ireland so it was a great success for us all around. The emergence and influence of UAE and Gulf investors is increasing the world over. What are your thoughts on the same? Here the market is very good for us and there are a few reasons for that: One is HH Sheikh Mohammed bin Rashid Al Maktoum and HH Sheikh Hamdan bin Rashid Al Maktoum are great supporters of Irish racing and the Irish breeding industry and without them we wouldn’t have a new Curragh in which they are big investors. They are big supporters so that’s one. Secondly, there is a massive base of owners here in Dubai and the UAE that buys our horses and attends sales in Ireland. Our next sale is the breeze-up sale that’s going to be at Tattersalls Ireland and a lot of horses here come from that sale and go on to achieve a lot of success. So it helps and I cannot stress how important this region is and to show how important it is, our nation’s ambassador will always attend race meetings to assist us because it is so important to meet the right people. This is a very, very important market and it warrants us being here. How do trips like these help with marketing the ITM brand? We will work very closely with owners out here and generally the smaller race days work better for us as we are able to meet with people: owners and trainers have time to talk with us. It’s nice to come to a day like this. I was at Meydan three weeks ago for a meeting there and it was a lovely night of the carnival but it’s just a lot more relaxed here sometimes, so you have to know when to be talking with owners and trainers because there are times when the pressure is on. Could you elaborate on ITM’s scope of work? Our role is to represent everything related to the racing industry in Ireland and whether that’s buying Thoroughbred farms or breeding farms or racing Dubaiowned horses in Ireland. So a big part of our job also includes helping people get visas and working on that and making sure when they come to Ireland they have a good time. Ultimately, we facilitate things and make things move. If someone wants to come and buy a horse, their job is to buy the horse and we do all of the rest. We want to make the experience as enjoyable as possible for racing enthusiasts in Ireland, whether they be owners, trainers or the racegoing public. With The Curragh ready after a redevelopment we want as many people from here to come and see the new Curragh. We have a new racetrack that is going to be opening up next month and it’s going to be absolutely spectacular. We are going to be able to welcome people from the region and offer them the same kind of hospitality we get here. We open in mid April during the Irish Guineas weekend. We have a very good team on board, with Jeremy Greene our main man here. He works well representing ITM and looks after the region for us.